Each island will welcome you with its own unique hospitality. 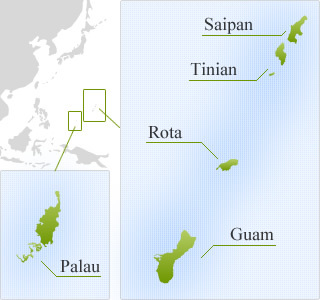 Guam is located south in the Mariana island chain in the western Pacific. Guam has something for everyone, men and women of all ages, including world-famous diving spots, golf courses, shopping, beauty salons, and so on. These resort areas are abundant in natural wealth and have many historical landmarks. A number of marine sports can be enjoyed at Managaha, and the surrounding transparent sea is just perfect for diving. Palau is located about 3,000 km south of Japan. It is a land of everlasting summer comprise of about 200 islands, both large and small. It is known as one of the best diving destinations in the world with a transparancy that lasts for 70 meters deep.